Howdy there, freaks and geeks! I guess Marvel isn’t the only Disney property that could be getting a sweet Netflix deal very soon. 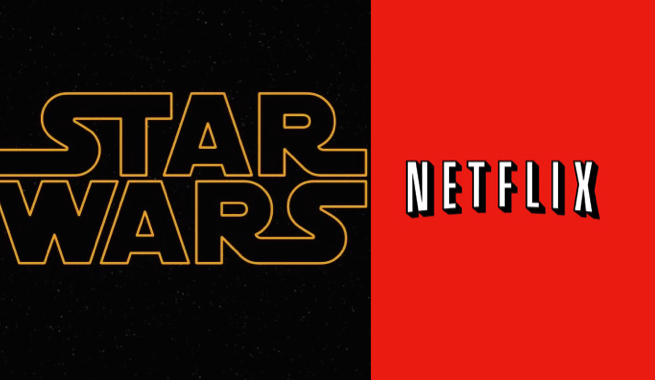 Several new online rumors have begun to surface suggesting that Disney and Lucasfilm are currently talks with Netflix for a string of live-action Star Wars series. It is very clear at this point in time that Disney is looking to utilize the same template for Marvel’s presence on Netflix by looking to preload at least three seperate Star Wars series into just one deal. These rumors are coming from an undisclosed source that says that given the success with Daredevil that Marvel and Netflix are hoping to continue their professional relationship with another massive Disney owned property. This news deviates from previously circulated rumors that there was talks to begin an entire television network dedicated to Star Wars. The sources were not able to provide any further details on any of the possible series, or where in the very long and diverse Star Wars timeline would the events of the series occur. We will know very soon as further developments occur in the wonderful world of Star Wars so stay tuned for further Up Your Geek updates. My questions for the readers are that would you like to see some solo Star Wars Netflix shows? What would you want them to be based on? Let us know in the comment section below! In the meantime while these rumors have not been fully confirmed Star Wars fans can definitely soothe their appetite for the hit franchise by seeing Star Wars: The Force Awakens which is set to hit theaters this year on December 18th. user in his/her brain that hoow a user caan be aware of it.